Working with partners is central to ICIMOD’s nature. We’re a partnership organization committed to bringing about transformative change by improving the environmental conditions and livelihoods of both mountain and downstream communities. To make sustainable development a reality, we work hand-in-hand with an extended and diverse network of local, national, regional, and international partners. 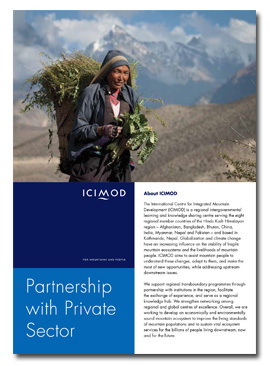 ICIMOD’s innovative partnership approach is based on equity, transparency, and mutual respect. From enhancing private sector partnerships to fostering regional cooperation to strengthening the capacity of regional member countries (RMCs), ICIMOD puts partnership services at the center of its operations and strategic decision-making. Private sector partnerships offer enormous scope for contribution to sustainable development. When companies make social and ecological concerns part of their business practice, it pays off. It’s increasingly recognized that environmental awareness and accountability is a social responsibility, a benefit to the bottom line, and a key component of effective development planning. ICIMOD’s regional member countries have a huge potential for growth, and entrepreneurial energy is needed to turn that potential into a reality. As users of mountain resources, employers of mountain people and members of the community, the private sector is the engine that drives the region’s future. It’s the private sector that creates employment and increases livelihood opportunities, determining the long-term prospects of communities and setting conditions for the preservation of invaluable natural resources and biodiversity. It is also vitally important to involve the private sector in climate change adaptation. Many large multinational companies and well-known brands now recognize the strategic relevance of integrating sustainable development into their core business strategies and across their spheres of influence. The role of the private sector in policy-making decisions and influence, at the national as well as global levels, is also increasingly visible and central to sustainable socio-economic progress. Sustainable development requires partnerships with the private sector.